Want to be happier every day? Well who doesn’t? Personally I am interested in exploring ways of helping me manage my wellbeing as I try to cut down on the anti depressants I have been on for the last 12 years (a process that seems to have stalled around the 20mg mark). 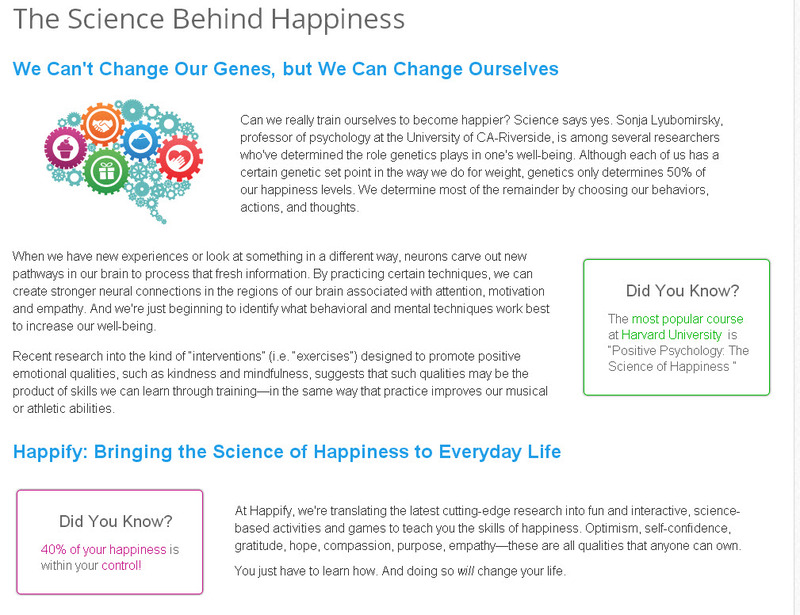 I’ve also recently been exploring the concept of happiness and what we mean when we talk about it. Professionally I led on the exploration and implementation of online learning within YouthNet. This means I am interested in how simple online activities can help our young users make the most of the information and expert knowledge we have available and really embed positive skills and actions in their lives. 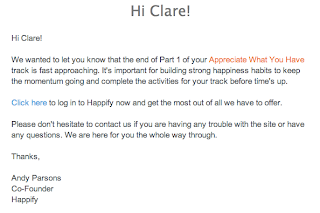 After being sent the link by a blogging friend (thanks Lauren) I decided to sign up to Happify and see what it had to offer. Happify hails from America and is a collection of activities designed to encourage you to spend more time each day on positive action for your wellbeing. 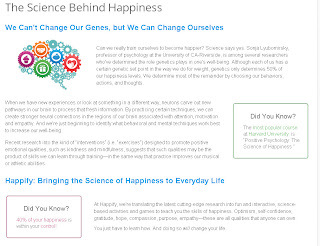 It emphasises that it is based on the ‘science of happiness’ and every activity includes a brief explanation of ‘why it works’ (perhaps a little too brief at times and starting with the catch all ‘research shows’). You start by taking a ‘happiness’ test which asks you a number of questions about feelings you regularly experience and gives you a score. I got 67 – but it’s not completely clear what this means (is it a percentage?). However it was useful to spend some time thinking about the range of emotions and feelings I had experienced over the last month. 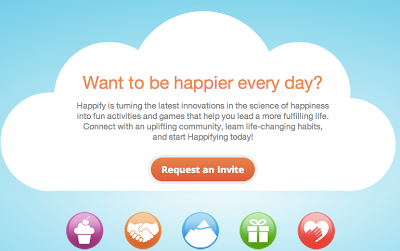 This is perhaps one of the benefits of something like Happify. Regardless of the content of the activities you take part in, the very fact of spending some time focused on yourself and your moods and emotions is a positive step. This is particularly true for those who haven’t spent much time doing that in the past. 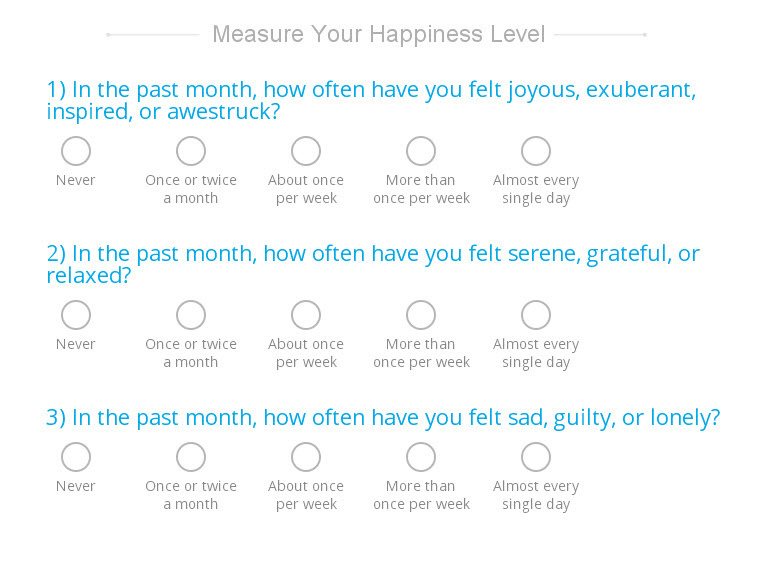 I wonder if there might be a place for a more detailed ‘happiness (or wellbeing) audit’ to encourage people to reflect on this in even more depth. After completing the initial test you are given certain suggested ‘tracks’. The tracks seem to be based around five main types of interaction with the world – savour, thank, aspire, give, empathise – with each activity within them focused on one of these interactions. The suggested tracks are identified by a quiz but you can choose whichever ones seem most relevant. I was directed towards the track that helped you cope better with stress, but in the end I went for the ‘appreciate what you have’ track. The tracks are timebound – taking place over about six days, with new activities being released over the week. I initially found this frustrating as I had some time on the first day I signed up and wanted to explore – but I predicted that the aim was to encourage people to keep doing small amounts over time rather than all at once. This was borne out by the email I received today (below). I also appreciated the email that I received yesterday which gave me some (actually quite timely!) 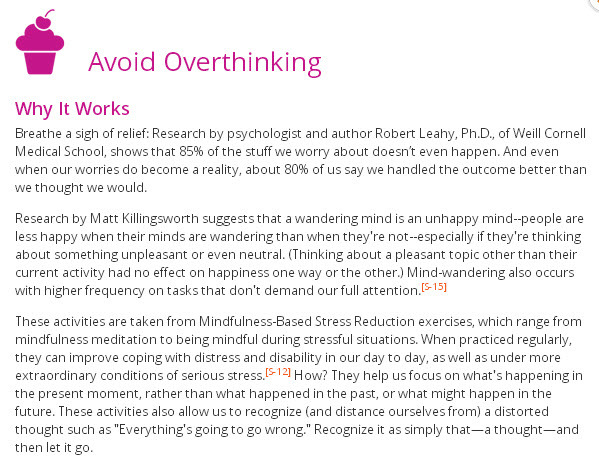 information about most things people worry about actually having a neutral or positive outcome. I have since read that the emails are perhaps too frequent. Too frequent communications tend to make me ignore them, or filter them off, so I hope that isn’t the case. The activities I have done so far are, in most cases, nothing new. They are all things that many of us know can help improve our wellbeing. The simple and speedy tasks include writing a list of things you are grateful for, spending time really looking at a scene in detail to identify and appreciate the smaller details, pledging to do something unexpected and kind for someone else and planning to appreciate an area of your neighbourhood you might not usually. 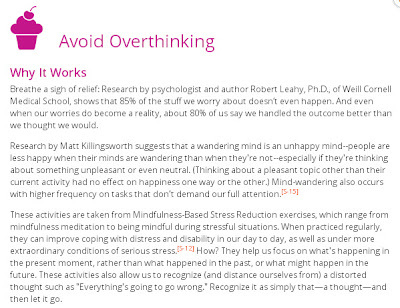 The benefits of mindfulness seems to be a running theme throughout. The activities often seem quite simplistic – but this isn’t necessarily a bad thing. I get the impression each one is designed to get you thinking, albeit briefly, in a slightly different way from usual. 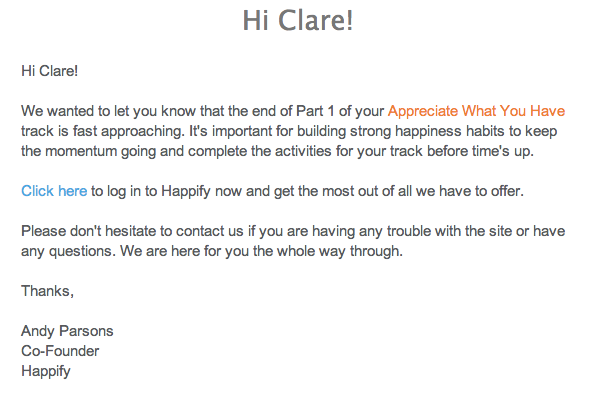 The advantage of something like Happify is of course that it takes those things you know you should be doing and puts them in a structure to encourage you to actually do them. For those of us who suffer from depression, we all know the tricks our minds play which can demotivate us and prevent us from keeping up those daily positive habits. Happify, and other structured online courses and interactions might be starting to identify ways of harnessing technology to help remind and guide us in these activities and thought processes – at least until they become more habitual. The disadvantages might be if the activities encourage you into a certain bias, or to make you feel like you ‘should’ or ‘shouldn’t’ be a certain way in order to be ‘happy’. A positive element to the activities is that a lot of them encourage reflection after the event – whether you completed an activity on or offline you are encouraged to return to the page and write a little about how you felt while completing it. Reflection seems to be a vital element in all kinds of online learning – we’ve seen hugely positive responses to the forums for reflection we’ve added to online learning at YouthNet. 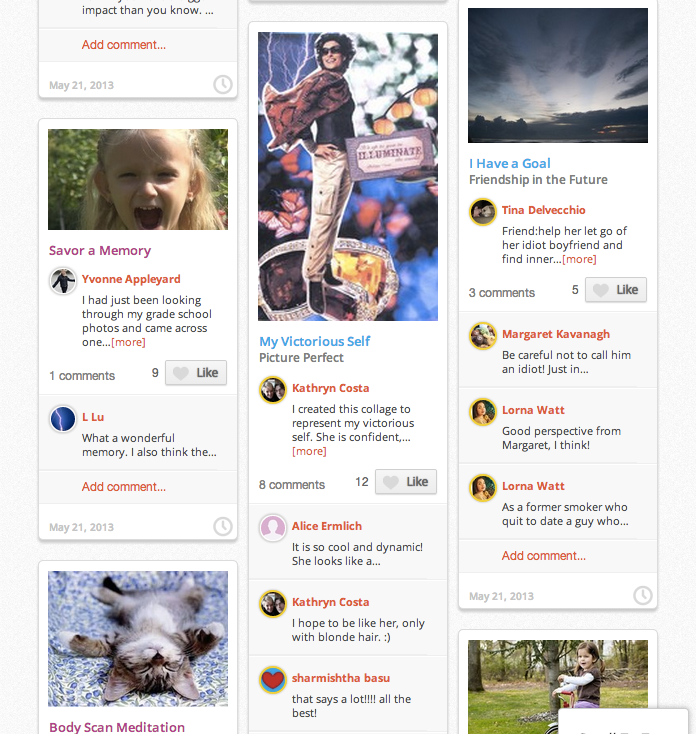 Something I do like is the community element – viewed through a Pinterest style board of recent actions and activities from others (including uploaded pictures and the options to comment). Despite having only completed one track so far, it gives you a good sense of what is to come and what others are doing. The comments and likes from others on your activities and actions could add a peer support element and an incentive to keep going. I would be interested to know how they moderate this, and what their moderating guidelines include. Will they allow for debate or less positive interaction? Finally, I thought the suggestions for crafting fitted very well with my own thoughts on ‘Crafting for Wellbeing‘ – so I thought I would add it on the end. I’ve got five invites to the beta version if anyone else wants to explore. I’ve only done a few activities so far and I get the impression there might be some more controversial ones ahead. 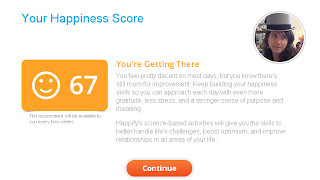 Happify might not have got it completely right but there’s a lot of learning to take from it. We’re seeing more and more of online learning for wellbeing and mental health and I think further harnessing technology to help us stay resilient is certainly an idea worth exploring. I’ll keep you posted. This entry was posted in All posts, Online support & communities, Training & online learning, Writing my mind and tagged Happify, Happiness, Learning, Mindfulness, Online Learning, Young People on May 22, 2013 by fostress.